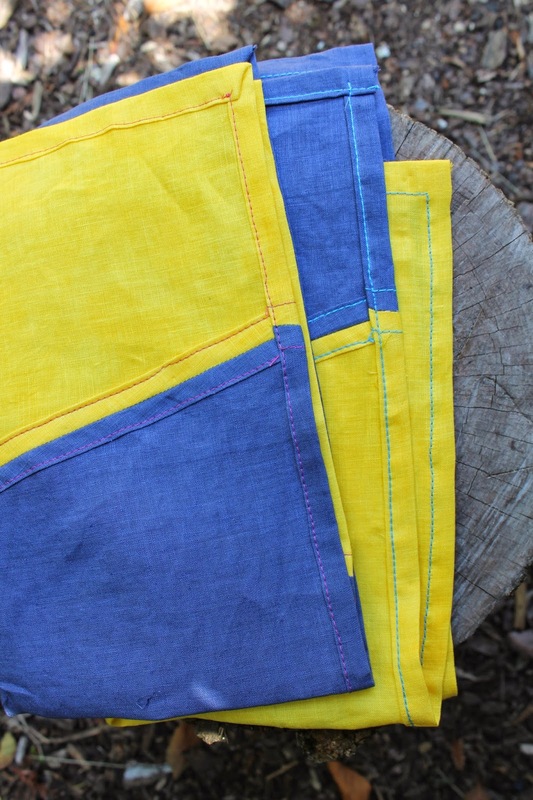 I finished sewing those linen kitchen towels I started a few weeks back. You'll remember I dyed the linen and found my inspiration from the incredible textiles that line the walls at Navy in NYC. I didn't exactly bang these out and I'm still not sure they are the best for absorbency but I did enjoy making them and they are a prototype of sorts. I plan to use them as drip clothes next to the kitchen sink for hand washed items but a friend pointed out to me that they would make really nice table clothes in a larger format. I think I will try that and also I'm inspired to make a wall hanging for one of the bedrooms. I went with pretty bright colors here to hide stains but will try something a little more muted for the walls. Also I will go with patterns and color combos that are less reminiscent of sailing flags for the wall hanging to avoid the cutesy factor. I'm not sure how to rate my sewing skills… They're decent but I'm still definitely getting better. I can make most household sewing projects like pillows, curtains and slipcovers that look pretty professional, but I'm aways working on my speed and of course perfection! I did a french seam variety here where the two colors join so that the towel is pretty on both sides. And I used contrasting thread on all of them for a little more pop. I'm both excited and scared to start using them. I'll just need to look the other way the first time someone puts an iron skillet down on one because I am definitely of the school that household stuff should be usable and never be too precious. Just as a note… Having a properly working sewing machine counts for about 90 percent of being able to sew stuff. Years ago I used to torture myself with a machine that was possessed by the devil which made sewing a complete exercise in frustration. When I got a new machine -nothing fancy, a basic Singer- I was dumbfounded by how much easier everything was. So if your bobbin always knots, or you have other nasty stitching problems, go get a new machine. You'll love yourself for it. do you find you cherish hand made more than expensive store bought (or hand made by someone else?). I never see the beauty in things i've created, only in what other people do! maybe that says something. no sewing machine in this house. i go through moments of wishing i had one. i have designed 2 trundle beds, 2 outdoor daybeds, an outdoor table, side tables and a king platform and I wish I had the carpentry skills and tools to execute! You are a renaissance woman!!! Yes ! I definitely cherish things that are hand made over store bought. I almost never buy expensive household items because in the back of my head I'm thinking…I could make that ! (which is both a good and bad thing). Everything you need to learn about sewing is on youtube. The same is true for carpentry, you just have to screw up the courage with those power tools. That being said, I gave up building furniture for a long period because it takes so damn long to execute anything, which kind of drove me nuts. Your method of designing and having someone else build is the way to go (I say as I'm currently building a new outdoor table -stay tuned for that). Sewing machines are pretty reasonable at big box stores now, i bet you'd be good. Other great thing about sewing is you can do it in spurts and just leave it -no glue, paint, etc to clean up every time. Oh I love that! I think you need an Etsy shop!! Thanks Crissy and omg I just discovered your blog. It's beautiful!